Arabs hurled firebombs at a Jewish building in the Abu Tor neighborhood of Jerusalem, just narrowly missing a gas pipe. In another terror incident that was mostly ignored by mainstream Israeli media, Arabs hurled three firebombs at a building that houses Jewish families in the Abu Tor neighborhood of southern Jerusalem on Saturday night. The firebombs nearly set the whole building on fire, but miraculously missed. Baruch Pross, a local resident, recalled the attack in a conversation with Arutz Sheva on Sunday. The incident occurred at 8:00 p.m. on Saturday night, when he was out, but as he returned home and approached the building, Pross recalled seeing police forces and border police officers in large numbers busy putting out the fire near the building. One of the firebombs nearly hit a gas pipe, said Pross, adding, "If that had happened the whole building would have gone up in flames." After the fire was put out, the commander of the local police station arrived on the scene and promised to handle the investigation in person and capture the terrorists. Pross said that the commander of the station gave the residents a feeling that he is seriously committed to capturing the perpetrators. 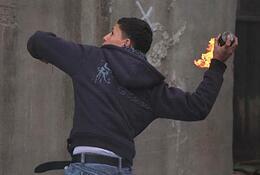 Jewish homes in Abu Tor have been the target of firebomb attacks in the past. Pross noted that Saturday"s incident is just one more in a series of violent incidents directed at Jewish residents of Abu Tor. In the past six months, he said, there has been a decline in the number of firebomb attacks on the building, but previously such incidents would occur once every two to four weeks. In addition to the firebomb attacks, the Jewish residents of Abu Tor have been the targets of repeated attacks of other types as well. Pross told Arutz Sheva that his son, who is in the seventh grade, was attacked two weeks ago by two Arab children the same age as him. When he tried to escape, another Arab around 20 years of age arrived and threw him onto the road. Another son of his was standing at a bus station last year when he was attacked by a group of Arabs who left the place only when he defended himself with rocks. In addition, Arabs constantly attack Jews as they make their way to synagogue during Shabbat, try to run them over and cause damage to their vehicles. Firebomb attacks have come to be the most common form of terrorism in Jerusalem, Judea and Samaria in recent months, according to statistics recently published by the Israel Security Agency (Shin Bet). On Saturday night, dozens of residents of the Shomron (Samaria) community of Karnei Shomron protested at the entrance to their community against the ongoing rock-throwing and firebomb attacks by Arabs. The latest attack occurred on Friday, when a woman in the seventh month of her pregnancy was lightly wounded when a rock hit the windshield of her car as she drove on the highway.